In 1832, when Judge William Wilkins built his estate on a broad stretch of green that lay to the east of Pittsburgh, he was a suburban pioneer, for 800 acres there was little more than a train stop. But that train stop was enough to make light work of a trip Downtown, and the prospect of being able to escape the daily noise and dirt of the city for quiet evenings at home began to attract some of the richest and most powerful men in the country. 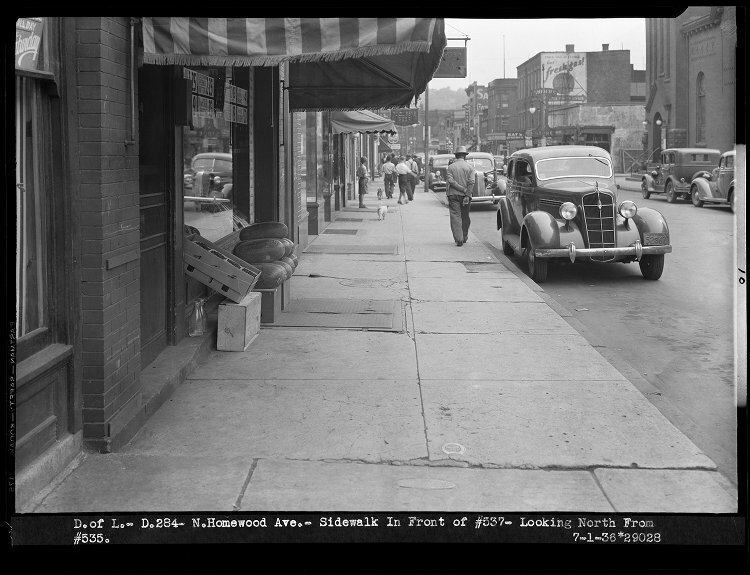 Since the 1940s, Homewood has been a major hub of black life in Pittsburgh. Though the Hill District has been recognized for its vibrant entertainment past, its famous sons and daughters, and its role in the city’s development, Homewood is often forgotten or dismissed. It has its own rich heritage, though, and had been integral in the history of the African-American community in Pittsburgh. During Black History Month, the Pittsburgh Post-Gazette is visiting and writing about some of the people, events and places that make up Homewood’s history. And so, like Judge Wilkins, they built their estates there, too, with stables, servants, carriage houses and formal names. George Westinghouse’s parcel was named Solitude, Henry Clay Frick’s estate was Clayton, John Heinz’s home was Greenlawn. But over time, the name of Judge Wilkins’ estate outlasted them all as the name for the entire area: Homewood. The growth of estates meant an increase in the number of servants to be employed. Some of them became the first black residents of Homewood, settling just north of the railroad tracks around Finance, Susquehanna and Tioga streets in the 1860s, and building their first neighborhood church, the Homewood African Methodist Episcopal Zion Church, on Tioga Street in 1871. Homewood began its life as a community at such an elevated socio-economic level that almost any subsequent change had to be downward. The population exploded over the next two decades, as middle-class workers rushed to occupy the new homes that were being built at a frantic pace. The population was a rich ethnic mix, including Italian, Irish and German immigrants. A second major shift in Homewood’s demographics came in the 1950s, when construction of the Civic Arena displaced more than 8,000 residents of the Lower Hill, most of whom were black. Many of them moved to Homewood. By that time, Italians were the largest ethnic group in the neighborhood. As more blacks, many of them poor, moved in, whites moved out. Homewood’s black population went from 22 percent in 1950 to 66 percent in 1960. But the overall population shrank, to 30,523 from 34,355. In April 1968, within a period of days, two events occurred that would spark changes in Homewood that persist to this day. On April 4, Martin Luther King Jr. was assassinated. Pittsburgh’s black neighborhoods, like those in other large U.S. cities, exploded with riots. More than 500 fires were reported around the city, and the National Guard was mobilized to restore order. The riots lasted for several days before a semblance of normalcy was restored. “Walking in and out of our neighborhood was like walking into the DMZ,” said Kevin Amos, who was in high school at the time. Dozens of storefronts were destroyed, their inventory either trashed by rioters or stolen by looters. Virtually overnight, one of the busiest shopping districts in the city of Pittsburgh disappeared. The second history-making event, less well-known, occurred on April 11, when President Lyndon B. Johnson signed the Civil Rights Act of 1968. One section of the act, Title VIII, came to be known in itself as the Fair Housing Act, for it guaranteed the right of blacks to live wherever they chose. The impact of that legislation on Homewood was not as immediate as Dr. King’s murder, but it was no less profound. For the first time, the middle-class blacks who had established themselves in Homewood could now buy the newer homes with larger yards to be found in Penn Hills, Plum and Monroeville. Many of them chose to do so, and a decade of white flight was followed by black flight. Between 1970 and 1980, Homewood’s population shrank by a quarter, to 15,158 from 20,266. From the days of its earliest growth as a middle-class neighborhood, Homewood had benefited from the presence of civic groups that sought to uplift the community and promote commerce there, but no agency had the wherewithal to execute a large-scale plan for the neighborhood until 1983, when the Homewood-Brushton Revitalization and Development Corp. was formed. Headed by Mulugetta Birru, the group launched an ambitious series of projects to renew the neighborhood. It published a newspaper, created a radio station, built a row of townhouses on Homewood Avenue next to the Martin Luther King Jr. East Busway, and masterminded the construction of both a Dairy Queen and Rite-Aid drugstore. But alongside those achievements, darker stories were unfolding. 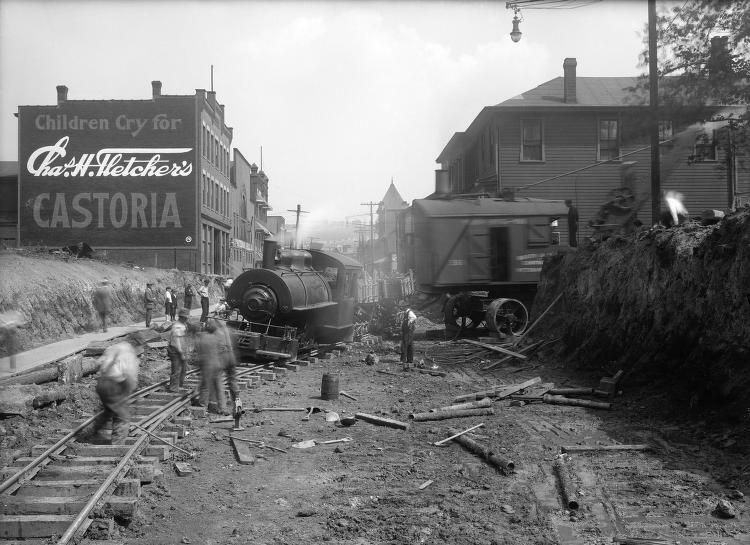 For one thing, the decline of America’s steel industry, which had begun years earlier, accelerated, increasing unemployment not just in Homewood, but throughout the city. Facing increased competition for fewer jobs, another wave of Homewood’s residents left Pittsburgh altogether, helping to shrink the neighborhood’s population to 11,511 in 1990. For another, Homewood, along with other black neighborhoods, saw an influx of crack cocaine and a growth in gang activity. The Dairy Queen and the Rite-Aid both closed after robberies. The loss of income from those enterprises, along with difficulties in collecting rents from its housing units, put the organization into a financial tailspin from which it never recovered. It has been inactive for a decade. Several agencies have recently launched new initiatives. The East End Community Collaborative serves as a primary clearinghouse for people who need a wide range of social services, allowing them to connect with more than 50 different agencies. Meanwhile, Operation Better Block is launching a new initiative to draw more people into forming block clubs geared for renters. And on Finance Street, where the first nonwealthy residents of Homewood settled so long ago, a row of new homes has been built. Two Boys on Homewood Avenue. October 25, 1935 Creator: Pittsburgh City Photographer. 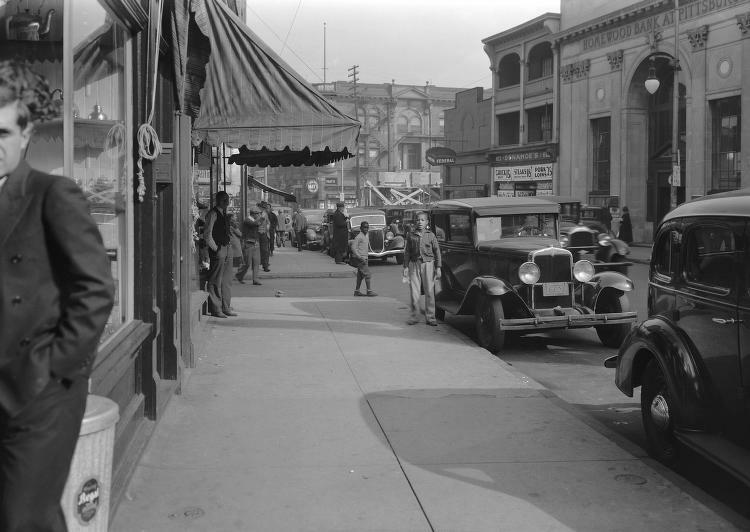 Description: North Homewood Avenue looking northeast from No. 613. Subjects: Homewood (Pittsburgh, Pa.) Banks--Pennsylvania--Pittsburgh. Homewood Bank at Pittsburgh (Pittsburgh, Pa.) African American boys--Pennsylvania--Pittsburgh. 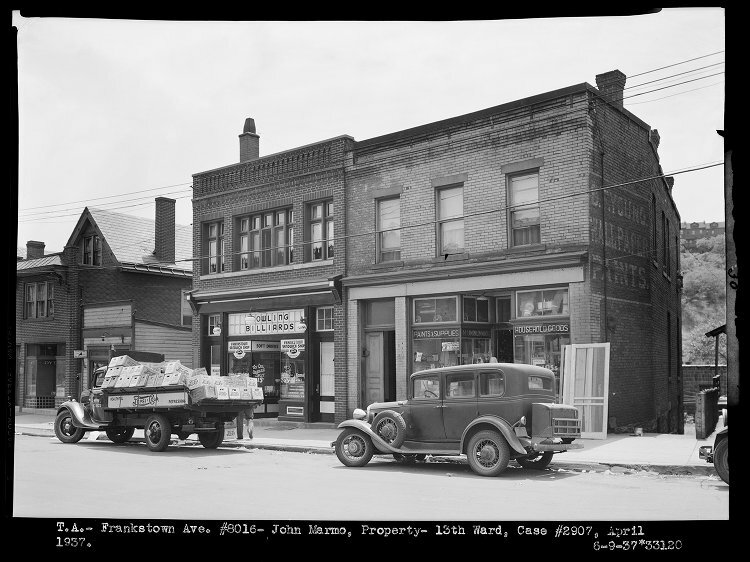 Donahoe's Groceries (Pittsburgh, Pa.). Location: Homewood Address: North Homewood Avenue Format: 6.5x8.5 Nitrate Negative Identifier: 715.3526632.CP Digital Collection: Pittsburgh City Photographer, Archives Service Center Collection: Pittsburgh City Photographer Collection, 1901-2002, AIS.1971.05, Archives Service Center, University of Pittsburgh.